The cleanliness and location of this Hotel is perfect for couples and families. The hill wasn't as bad as the reviews made out if you cut through commodore. Maid service every day and the pool area is kept spotless. I stayed here with 5 friends and thought it was really good, it was a little cramped at times but your not really in your room that much, so it doesnt really matter. we did have to complain about our shower on the first day becasue it wouldnt work properly, but it was sorted out that day and it was fine, tina that works on reception is English and really helpful, when we had to vacate our room at midday on the thursday, and our pick up wasnt until 4.30 the next morning she went out of her way to find us a curtosy room, even though the hotel was completly booked up, and she did, it only worked out at 3.50 Euros each, which was good! the food in the snack bar was really reasonble and tasted good, the service was really fast aswell. Use the Commodore pool, instead of the Captains, its alot more spacious and clean. Even though everyone on review sites complained about the walk up the hill, it wasnt that bad i thought, if you cut through the Commodore it makes it alot quicker and easier!! loved it at the Captains, and i would definately consider going back. 6 of us stayed here and it was great! The staff and the reps were really helpful and friendly. The rooms were a little basic and the maid service was poor but apart from that it was excellent! Me and my friend came back from zante on monday! While were there we stayed in the Captain's Studios and i dont have any complaints at all. They have everything you need, the rooms are immaculate and really nice especially if you get a room at the front with an amazing view. The staff are also lovely especially Tina who works on reception. So i would like to say to anyone whos staying in Captains, dont worry cos you'll love it. Going to stay in Captains Appartments in Argassi in July 05. Have read previous comments - some excellent some not so! Anyone been this year ? Will be going with hubby and 2 children (11 and 9) is this going to be the worst holiday or wot? Have they improved the airport or is it still horrendous? Thanks to anyone that responds - your honesty will be appreciated. We stayed here in May 2005 for two weeks and really didnt want to leave the staff at the Captains are fantastic - Tina, Cheryl Karl Darren Steph, Sam Clare and loads more!! they made our holiday what it was and we miss them all loads the Hotels (Admiral, Commordore and Captains were all of a good standard - sometimes the food was a bit to be desired but the atmosphere was quality and the bar at the captains was of course the best by far and the reception? well cant fault it!!! kids club is great for anyone taking the family and the Admiral is great for the entertainment if anybody is going here soon say hi to them all from sue and graham thanks so much. we're hoping to come back in september! we went to the captians in june 2004 had great time nice and clean friendly staff nice pool plenty of sun lounges. the food was good at the poolside snack bar. the rooms had a shower curtain which is good for greece.toaster microwave kettle fridge and a nice freindly atmosphere although up a steep hill there is a short cut via steps. i went with my wife and my to daughters age 14 and 15.and would recomend it to anyone. used to work here. loved it loads. want to know what happened to sam and michael from last year. cody miss you loads. Wife is very fussy about cleanliness, but to my amazement she did'nt end up using the bleach that she packed. Kids loved going out in the evenings and we went to a couple of the greek nights at the admiral hotel that we got invited to for a few euro's each there was entertainment and food included and the kids loved as you can join in with the dancing. The wife felt it was safe enough for our 14 ear old to go out and do a little shopping and we found all the greeks were great fun. Restaurant that got the kids vote was the three brothers fish restaurant and good value for money. Went to the shipwreck and i must say it was fantastic. Also you can go turtle spotting and that was brilliant. The pool was nice and you can also use the pool at the commodores hotel next door as all the same management own them. A little tip don't walk all the way up the hill you can walk into the commodores and use this as a short cut and they really don't mind. Went out every night and the little town comes to life, peter works at tiffany's pulling in the trade and as nice as he is he is very persistant. My tip is to say you've already eaten to get him off your back(bless him) I have booked up again for two weeks next year so that says it all. gary and co.
hi we are going 3rd oct please keep reviews comming as i have a few mixed feelings on this holiday as never been to greece before any body got hols booked then? After reading comments from previous holidaymakers we wondered what we would be going to...but were pleasantly suprised, the view from the dining room was beautiful, we found our way through the Commodore to do the steps rather than the steep slope..(this is not a place to be if you have difficulty walking)..the staff were very kind and helpful, the food although not huge selections was very good.. and the chef put in an appearance most evenings. The swimming pool is small and with the number of children increasing in number by the day I guess in peak season could not be classed as a swimmimg pool, however, the pool next door at the commodore was bigger and we were able to enjoy a swim there. Don't book coach or boat tours with the travel company, go down the main street they are same tours at half the price. If you fancy a crepe or a lovely icecream visit the 24 hour snack bar on the right of the main street.Taxi's are a good way to get around..we didn't see many local buses ! All in All a good holiday and would go back to The Captains for another. We have just returned from two weeks in the Zante sunshine and thought it was absolutely fab, its the best holiday we have ever had and would go back in a minute. The place is majical, so relaxing with no stress at all. We enjoyed staying at the Captains apartments as it was the quieter of the three (Commodore and Admiral), although it is probably the most basic as far as rooms and amenities are concerned, for us it was clean and tidy. The location of the apartments was ideal for us because it was far enough away from the bizz of the main street, I'm not saying we dont enjoy the bizz but we can have it and then leave it. Just come back from a fortnight at the Captain's. As a couple we deliberately booked outside school holiday time thinking that the resort wouldn't be fully geared up to entertaining children...big mistake! Many parents seem to take their kids out of school to go on holiday, it's not just that different areas have different holiday times either, we heard a few kids boasting about how they were going to school for two days after the holiday and then breaking up for half term. That meant the pool having VERY loud music all day. Thank God we weren't on the pool side of the apartments, as that would have meant us demanding a move as we heard quite a few couples doing. We were on the side that overlooked the gorgeous Ionian sea which just about made up for the noise from the pool, which was especially crap during the "Greek " night which seemed to be on the lines of the Bruce Forsyth's Generation Game - ie everybody has a go at the dance - I think we counted 15 attempts - but to the SAME MUSIC! We went to the Admiral's one day which was OK, but if you fancy a day by the pool then the Mimosa is the one to go for, down the road (avoiding the restaurant touts that have been previously mentioned) then turn right and it's about 100 yards on the left, lovely pool,no kids and a nice bar. For eating, we liked the Granada Bar best of all, it's 100 yards further on from the Mimosa, on the right...we found it purely by accident on the first day (trying to find Argassi's beach - huh!) and never really left. Peri, the owner, is really friendly, it's a real family run place (Mama's in the kitchen!) and there's no pressure at all when you're there, in fact Peri seemed glad that we actually took our time to have a few beers, then a few starters, then a few more beers, rather than the one other time we ate at another place where they obviously wanted us out as soon as we'd eaten. The best value trip we had was the turtle trip. For 15 euros each, we got picked up in Argassi, taken to the boat had a couple of trips round the bay then went to Marathonisi Island to dive off the boat into crystal clear seas onto the deserted beach of a deserted island. That's a MUST! Don't bother buying anything here that you don't think you'll be able to get over there - they've got the lot. Check your baggage weights - we got done for �60 on the way out, on the way back the scales weren't even turned on! If you're going out soon, learn a few words of Greek, hello, thank you, please...it's not too big a deal and if you're going to Captain's, the gorgeous receptionist is called Dora (pronounced Dthora), she's working there for 3 months without a day off , so buy here some chocolates when you leave, she deserves them because she has to deal with some really ignorant Tw4ts who make me ashamed to be British!! the captains hotel is family based. un fortunately u have 2 go to the admiral apartments 4 the good night life. all of the staff are cool, especially new bar man stu!luckily u get 2 use the admiral and comodore facilities 2. the bad thing is that just to get to the hotel u have to walk up a very steep hill and then about 200 steps. overall really good holiday. if u r going there give stu lots of tips! WHAT A LOVELY FAMILY HOTEL, EXCELLCENT FOOD, VERY FRIENDLY, EXCELLENT LOCATION, VERY CLEAN. WE HAVE JUST GOT BACK FROM 1 WEEK THERE IN MAY. ROOMS WHERE CLEANED EVER DAY. WONDERFUL VIEW FROM THE HOTEL. WONDERFUL COCKTAILS IN THE EVENING. We had an amazing time while stay at the Captains Hotel. the room was a good size the bathroom was a bit small but it had everything that you need and was always kept clean. All the staff were very friendly and helpful. it was in an ideal location you were close to everything and the view was perfect. The pool wasn't massive but you do get use the pool th the wmming pool next door and they are pratically joining anyway. i would recommend the hotel and the location to anyone. I stayed at the captains with my mum and sister May this year! I found the hotel was in a wonderful location! There is a shortcut through the commodore hotel which means there is no need to walk up the steetp hill! we were siutated at the back of the hotel which meant it was very shaded and we couldn't exactly sit out on the balcony and soak up the sun! the rooms are very small and basic, but it never bothered us anyway because we were never there! I would recommend this hotel to anyone, and would definately go back myself! I am due to stay at the Captains Hotel in June 04, and have read mostly bad comments. I am going away with my boyfriend, and wondered if it really is as bad as it is sounding! If anyone has any going points from a couple's point of view, i would be grateful to read them! - Way too many kids (Uncontrolled). - Very steep walk to hotel if you choose to use the hill. Other than the above the hotel was clean, although we didnt have a great view from our room, we could easily go to the balcony outside the bar/main restaurant and relax with a few drinks and mop up the view. The food i have to say i thought was being cooked by one of my old school canteen women, considering a chef was cooking the food i expected much better and he wasnt fooling us by serving the same slop every day and changing or flavouring the sauce slightly different. The cleaners were like a previous person said, good if you strip the bed and leave them in a pile in the room, otherwise you need to sweat in them another night! If you have a room at the back of the hotel please feed the poor wee kittens as you can't help feelin for them [check out the pictures]. I would recommend the captains as a good "family" holiday hotel, if your a couple thinking about going here, trust me "Dont do it!" Returned from the Captains yesterday (25/9/3)after 2 weeks and couldn`t wait to gethome, what a s*** hole. To begin with, its at the top of an incline which starts with about a 30 degree climb and on a bend increases to what seems like a 45 degrree climb, talk about breath taking it surely does that, and gets you at the back of your legs too. We where in the basement after being told "a good sea view" what a joke, it looked out onto a block of apartments except for one corner were you could just see the sea, the room was like a cell without bars, combined with a hospital ward (to many beds). Meals seemed great when we arrived but every day was the same but arranged in a different position to give you the impression it was a change from the day before, plastic eggs on the breakfast menu daily and other things also the same, tea is always with condensed milk, ug! water melon almost every day for after dinner sweet. The rooms are cleaned daily, mopped and bed sheets folded, to get a towel change you have to put them in a pile on the floor, bed sheets too. The cleaners seemed to spend more time sweeping up dropped leaves outside than doing anything else. Pool area was ok but due to the hoseing down every morning, always seemed to be flooded,if,like me you get there to early, (8-45), far to many sun beds and hard plastic so buy a li-lo, talking of which they allow too many in the pool, so a decent swim was out of the question. Also far to many kids ( and I like children so don`t take it the wrong way) but we went to avoid them thinking they would be back at school, no such luck, we got that one wrong. Our own rep. (Cosmos) we saw at the welcome meeting day after arrival, but never again until the evening before departing. Thompson rep. Karen, on the other hand was always there and only to pleased to help, no matter who you are with. Hotel staff, a special mention here for Donna, a 21 year old from near Bristol (I think) worked very hard and tried her best to please every one , she really is a nice pleasent girl. She`s moving to The Factory next year (a pub. down the hill) all being well. Also the main receptionist, Andreos, he is also very helpful and speaks good English, George the chef has a good grasp of English but to me seems to be under a lot of pressure from the top. The rest of them arn`t worth a mention, oh Nicco is ok, but by far the best is Donna, she will be missed next year if she does move. Would I go back to Zante? 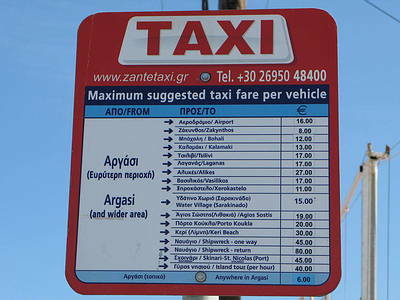 yes but certainly not back to the Captains, Lagana or Kalamaki is much better,flater and cleaner than Argassi. 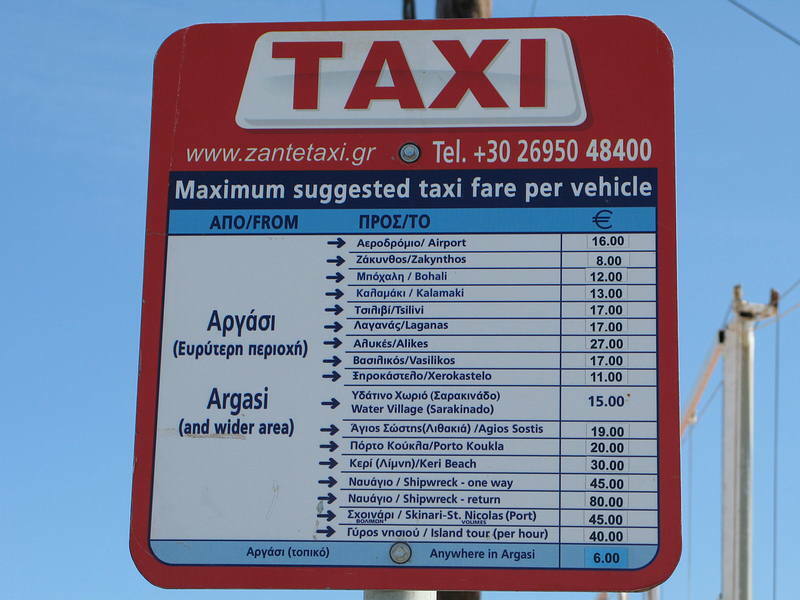 As a last word or two, on car hire (which is worth a few days) see George at Olympic car rentals, he seems to be the best around and has a lot to choose from, Mention the Just Zante web site and get 10% off. You don`t have to take my word for the above comments as you make up your own minds, but in closing i`ll just add that my holidaying partner was in bed ill for 5 days with the super runs. We wont be going back there and anyone that does MUST BE MAD!!! The pool was filthy and all in all we feel that it was a terrible waste of money.And lastly the weather was dreadful that was just about the last straw for us!!! we just came back from the captains on the 21.09.03 it was excellent the room was cleaned every day.The maids were good the food was excellent good choice.my regards to george the chef lovley mossaka.Also the pool was cleaned every day. The staff were very helpfull changed our room when not very happy would go again brillaint holiday well done. Stayed at the Captains in the first week of September 2003,on a half board basis.Quite a good hotel,with its location for views a big plus. Food was reasonably good quality,however little choice at breakfast.Rooms were basic,but were clean! !If the place was given a new coat of paint,and new furniture it could easily be 4 star. However i would recommend it as it stands,and if you are to stay there you will enjoy the hotel. Hi 2 everyone working at the Captains me and my family just got back yesterday. Missing it already. We got on really well with the Rep for Sunset holidays Matt. ( Matt, remember us the geordies! ) Can someone please e-mail me at ams_da_bomb2003@hotmail.com if they know any ways we can get in contact with him as we got on really well. I got back from Captain's Hotel on Friday and I wish I was still there! The resort was brilliant and so was the hotel, along with the staff of the Captain's and the Admiral, especially Sam, RD, Michael and Danny. For anyone who is going out there soon, take plenty of cash and go out every night, even if it is only to the hotel bars. I'd love to stay in contact with Danny and Michael because they are ace!!! I am going to the captains on july 1st. Im 16 an my boyfriend is 17. any good ideas on a night out anyone? 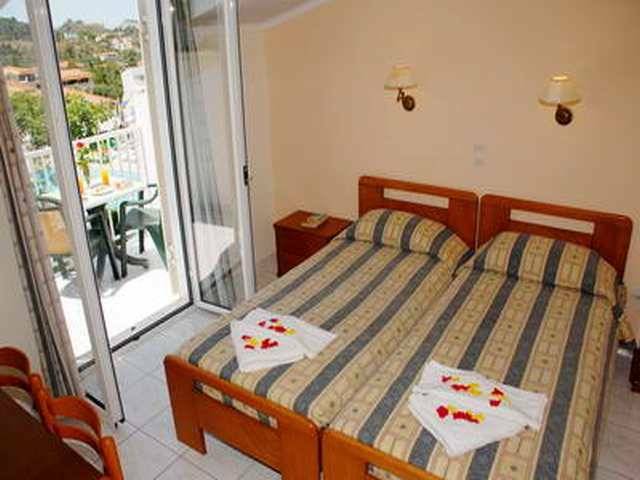 i went to zante and stayed in the apartment next to the captian and they are all run by the same ownere and i was wondering if i could some how get in sontact with donna, michael and the bairmaid sophia?? Im a 16 year old girl whos going to the Captains at the start of july im just afraid that there'll b no one ny age and nothing 4me 2do!help!ne suggestions about niteclubs,ive heard loadz bout the factory whats it like?thanx! Beware the sound of evil, kareoke noises echo everywhere especially when sighted at the top of a hill!! Views are breathtaking, food is plentiful but can become repetative and boring. AMSTEL IS 2 EUROS NEARLY EVERYWHERE AND PRICES HAVE SOURED SINCE 2002....TAKE PLENTY OF SPENDING MONEY OR PLASTIC. The Captains is quite an old building. And this is reflected in its decor. It does have a large dining room, and for any one on a budget it does offer quite a fair range of meals at a good price. It does have a reasonably large terraced pool, and the use of next doors pool. The kitchen cant really be used for anything more than making a pot noodle, and the smoke detectors didn�t like me frying bacon. 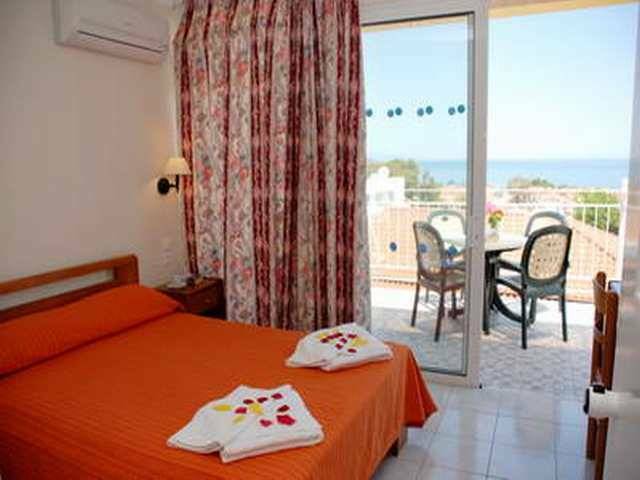 The front of the hotel looks out over the sea, whereas the back looks out onto people�s private houses. Having said that, the back is quiet, and gets the sun. The front gets the wind from the sea and is mostly in the shade, and so cooler. The staff were friendly and attentive, and helped us out after the holiday company decided not to pick us up for the return journey home. On the down side, the captains does sit quite high up on the hill side, and its a hell of a treck in the midday sun. Would i stay there again? Yes. We have not been yet.Booked in for the first week of September 03. Included in our party are 2 x 20 yr olds and a 17 yr old. Bit concerned if there will be enough to keep them amused, as they like clubbing etc. Any comments/recommendations appreciated. We have read mixed comments about the food and entertainment. Has anybody been recently that can put our minds at rest? also take the free bus from the wreck bar which takes you to st nicholas beach for the diving /watersports you dont have to join but the beach is great for kids .the wreck bar has a pleasant play area out the back suitable for toddlers altho mine are 8 + 6 now and still enjoy it. ok mark the captains is at the top of a monster of a hill!!!!!!!!!!!!!!!! I am staying at the Captain's Hotel with wife and 2 kids 3,2 arriving 08.05.03.....can somebody tell me how steep the hill is, what are the local alternative beaches,and is there any additional play areas for toddlers? I havent yet been to the Captains hotel, but am of there in July (the 20th actully) and I am a bit worried about wether or not there will be people of my age there. I am 17 as is my step brother and i have another brother of 15 and a sister of 11. I have gathered from the comments of others its a good hotel suitable for families, but will there be lively people of my age there, who will be looking to explore the pubs and clubs of the island. Please help!!! Thanx Kirsty Levine. HI THERES 8 (5 ADULTS 3 KIDS )OF US STOPPING AT CAPTAINS IN MAY 4TH MAY 2003 CAN U GIVE US ANY TIPS ON PLACES TO VISIT FIRT TIME IN GREECE THANKS ANY HELP WOULD BE WELCOME EMAIL ME AT STEVENWILLEY@LINEONE.NET. Good hotel, rooms tidied daily. Evening entertainment is not too good. Food is good but much the same each day. Nice views, but quite an uphill walk back to the hotel from Argassi town. Rooms at the back of the hotel remained very hot till mid evening and this was in early September. Rooms facing the pool and sea front would probably be cooler. The food was generally good but was repetitive, especially at breakfast. There isn't much entertainment laid on during the evening and you will have to get up early if you want to reserve yourself a place by the pool. The staff were however very helpful. we went to captains argassi in July 2002.We had no problems with it.The staff were friendly had a great pool generally good meals although lachs a bit in selection.The only problem is that it is on a hill but you will soon get used to it.Definately take a trip to smugglers cove-it is beautiful and also do turtle spotting.Argassi beach isnt overally attractive so we just stayed around the hotel pool that we had no problems with.Tsilivi and St Nikolas beaches are the best. We went to Zante July 2002 and stayed at the Captains, 7 of us (ages 3,4,8,10,34,35 &62). 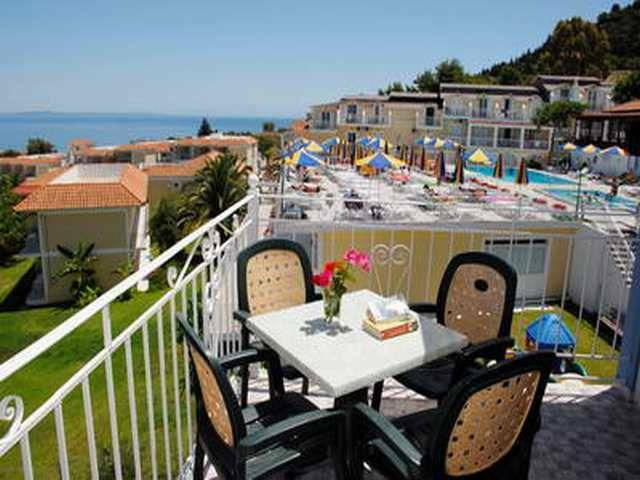 A nice hotel, great view of Zante town from our room. The food was good though not a great choice, they could do with a childrens buffet. Entertainment in the evenings was poor with a quiz practically every night at 10.30, nothing to keep you in the hotel and nothing for the children in the evenings.The children loved the pool though you couldn't get a sun-bed unless you arrived very early or late in the afternoon like us, most people left their inflatables by the pool overnight and they stayed there,except our boat which someone nicked. The Tropicana Centre is excellent especially the cinema which shows the latest releases for free as long as you buy drinks from the bar. Argassi is a good resort plenty for all, for children there are kiddycarts and mini golf, beach is tiny though. Gerakas has the best beach on the island.we hired a car to get around which I recommend if you want to do more than just sunbathe. Blue caves and the shipwreck are worth seeing. We saw the turtles on a boat trip from Laganas, brilliant. Laganas resort is lively but the beach and sea were dirty. Plaka beach and Tsilivi have good beaches. Alkes was a very good resort and the tour train was well worth the money as you go to a museum, a church and a taverna where you get a glass or two of the excellent local wine, an English guide too. We had a great holiday, plenty to see and do though no decent waterparks which disappoionted the children. We stayed at the captains for 2 weeks in july, It was nice and clean with fantastic views over the island would not recommend room 102 as it was directly in line with the bar and restaurant. We also found it impossible to get a sunbed as people reserved them over night!! Resort itself was nice with plenty of bars and restaurants. We spent a fortnight at the Captains in June 2002 and had what must have been the worst room in the place. Room 101!!! I would only recommend the Captains to over 65's who want to be in bed by midnight as anyhing above whispering after midnight is not permitted. Argassi is the most boring place i have been and the resort can be walked around within 15 mins. After walking down the street from the Captains we would toss a coin to go left or right and after about 800m each way the resort was at an end. My 11 year old son was bored and hiring a jeep for a few days was the only escape from the boredom of Argassi. Zante itself is a beatiful island and I would go back, not here though and definately not the Captains. At 33 Laganas was far more appealing. My advice would be if you are booked here at either the Captains or Argassi, change your booking quick. 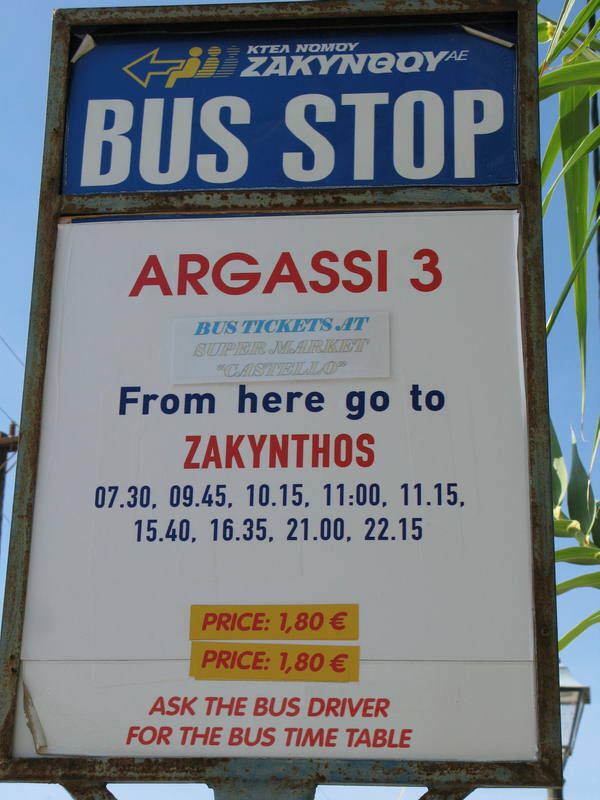 For peace and quite try Kalamaki or Alykes, for a bit of life and lovely beach go for Lagana. there are safety boxes in each room which cost 15 euros a fortnight with a 2 euro deposit. Well worth getting this. Box is quite big - can fit all documents, money, camcorder and large camera in it quite easily. hope this helps! came back 4th july from a week stay in the captains. God help you lot that are going in the school holidays if you dont have kids, loads of them everwhere. Very difficult to get a sunbed if you dont get up at the crack of dawn (people actually leave the towels on them overnight and they were not German!! Sados!). If you do have children, very good. Kate the childrens entertainer is very good. Teenagers will be happy with the pool table and the table tennis. the resort is very touristy, dont go here if you want to see greece! Food ok, didnt eat in the hotel though. Hill not so bad, just cut through the commodore. Hotel very clean. No complaints really. It was all pretty much as i expected it to be. We are going to Zante in a couple of weeks, and have recently read about a mysterious illness which has closed down all the educational buildings and has also killed 3 people. As we have young children I was wondering if there was any cause for concern? Or maybe even cancel the holiday altogether? Any help would be appreciated. We are visiting the Captins in June 2002. There will be four of us, 2 couples in our 20's. Can anyone tell me what to expect as we don't want anything too lively but enough bars and restaurants to choose from?